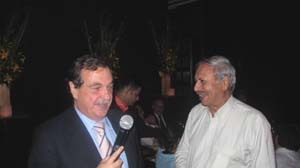 The dinner organised by the Delhi Wine Club at the Hyatt Regency in collaboration with the Chilean Embassy and attended by a record number, was a statement of the enthusiasm by the members, ProChile promoting Chilean wines and another display of ingenuity and creativity by the Hyatt Regency F & B, writes Subhash Arora who had seemingly flown specially for the dinner from Torino where he returned the following day. 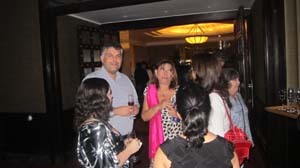 Whenever Delhi Wine Club organises a really special event, the organisers immediately think first of Hyatt because of their proven record of giving a package of an excellent evening without any glitches and the display of creativity in the ambience is a part of what the members look forward to. It was an obvious first choice when we decided to organise a Chilean evening in conjunction with the Chilean Embassy on Monday in May. 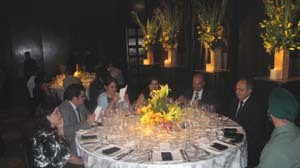 The seats had been ‘sold out’ much before the Menu and the list of 6 Chilean wines to be served was circulated to the members, once the venue was announced. The number of requests kept on going up continually till the last day when the hotel decided to organise it in the Ballroom which was fortunately available on this day, unlike the original date a day earlier on May 15 when the hotel was totally booked and still we had been offered space. If it was a bouquet of 8 Riedel glasses that impressed the guests during an earlier dinner to welcome the then new Ambassador Cristian Barros and his wife Polly it was the beautiful flower and fruit (no prize for guessing which variety) settings that won the heart of people as they entered the Ballroom where the seating arrangement for 70 people had been laid out along with the usual walk around area for the aperitifs. The chilled Fresita Strawberry sparkling wine was a welcome drink that accompanied the snacks which were delicious as usual- the Argentine Chef Maria had given an even more delicious twist to the Chilean empanadas in her Humita empanadas which were more juicy. The wine was a low alcohol, sweet and fruity bubbly made with crushed strawberries- more like an Italian Bellini with white peaches and Prosecco. Many people found it a bit too sweet and purists might have even sniggered a bit, but it is a perfect wine for beginners-and it did go well with the Puff pastry and croquettes. Chilled Gazpacho was a welcome addition. I loved my Shrimp with avocado tartar and double cream cheese with the Santa Digna Reserva Sauvignon Blanc 2009 which is a refreshing aperitif any time of the day. Matching wines with soups is always a challenge and the Green peas and mint cappuccino with Goat cheese crouton was no exception. The Montes Alpha Chardonnay 2009 was slightly too oaked and the Luis Felipe Edwards, Pupilla Merlot 2009 did not bring any excitement to the soup. Rodrigo Sepúlveda, Export Director of Maule-based Balduzzi Winery in Chile was in town and we had invited him to the dinner. He talked about the wines during the courses and though a few members found his presentation a bit too elaborate, several members including those who had passed the WSET examination organised by the club earlier, found it very interesting. The last minute change by the hotel in the main dish from the New Zealand lamb leg Confit was quite disappointing for many members. Although San Pedro Castillo de Molina Reserva Carmenere 2008 was an interesting match for the substitute chicken dish it did not do justice to the Emiliana Adobe Cabernet Sauvignon 2009 made from organic grapes, though the wine was a favourite with many. Balduzzi Cabernet Sauvignon Reserva 2009, a couple of bottles of which Rodrigo had carried with him was a welcome add-on as the full bodied, balanced wine with plenty of blackberry and other berry fruits was quite delicious and would be a welcome addition to any hotel’s list at an affordable price. In all there were seven wines served- perhaps a time has come when we should ‘taste’ some wines before sitting down for the dinner. 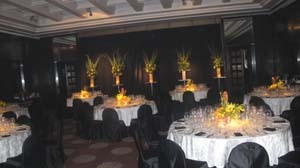 All in all, there was a good balance between the members and the Chilean guests who helped the event become the most attended wine dinner. Kudos to the Hyatt for taking the number that kept on going up and at the end gave an excellent service.